by Molly Stevens, Norton, 2004. This heavy, award-winning cookbook is the bee’s knees and the cat’s pajamas for those who count stews, gumbos, hearty soups and ragouts as among the few pleasures of winter – homey one-pot dishes barely bubbling on a low flame on “the back of the stove,” keeping the kitchen cozy-warm and full of tempting aromas. 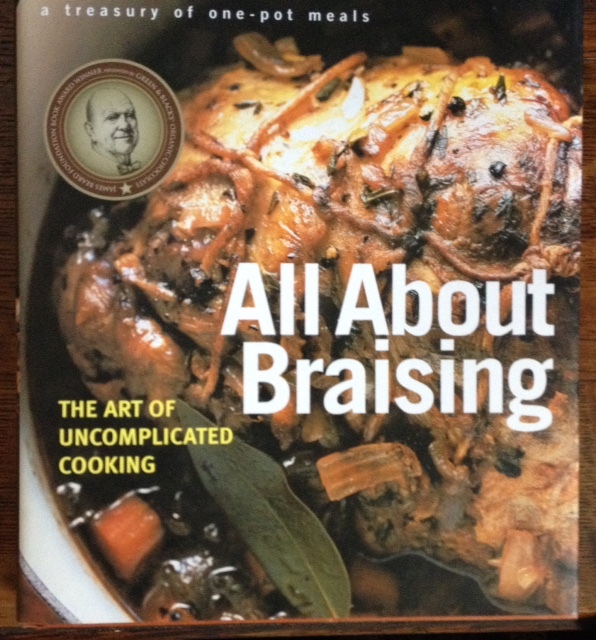 Stevens’s book took the 2004 James Beard award for the “Single Subject” category, and no wonder. First of all, the author, who's taught at the French Culinary Institute in NYC and La Varenne in Burgundy. offers 150 recipes, ranging from quick braised weeknight dishes to slow-cooked weekend meals, She offers not only classics like Short Ribs (Ah! But Short Ribs braised in Porter Ale with a Maple Rosemary Glaze!) to the unusual, such as Vietnamese Braised Scallops and Red Cabbage Braised with Maple and Ginger. She also guides readers to choose the right braising pot, one with a tight lid, that “is both flameproof and ovenproof” and “holds the food snugly.” Why? Otherwise, she writes, “the vapors and steam will swirl around the sides without coming in contact with the food at all,” thus compromising the concentration of flavor juices. There are paired wine suggestions with every meal provided by master Sommelier Tim Gaiser. Heavy hardback, with DJ, coated stock pages, 25 color presentation photos and 25 line drawings, 481 pages. A handsome book that would make a great gift! Condition: As New.